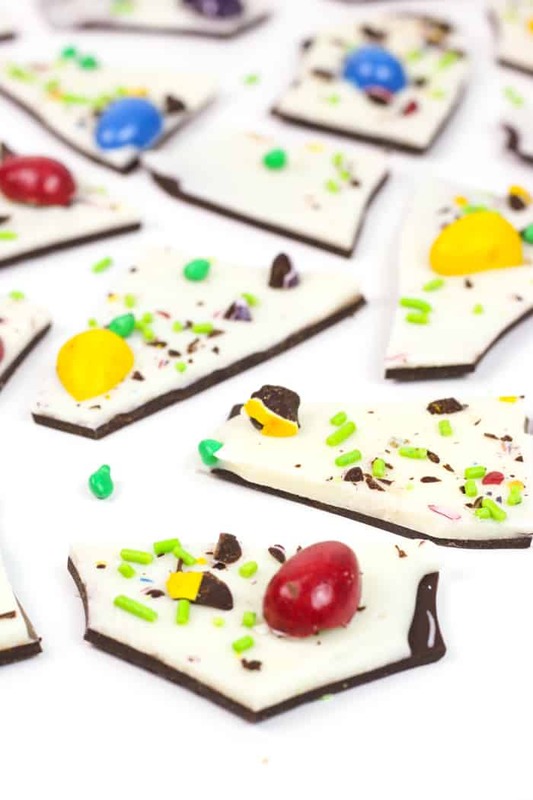 Make a colorful batch of Easter Candy White Chocolate Bark, the ideal Easter basket stuffer. Top it with all your favorite candies, then share it with friends or keep it all to yourself! 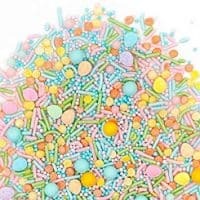 As with any holiday, the candy is probably one of the best parts. Halloween is a prime example of this, and Christmas and Valentine’s Day too. The same can be said for Easter candy. 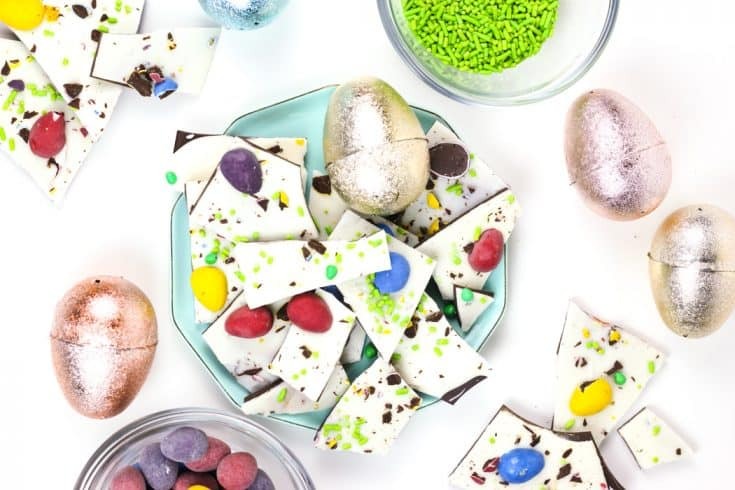 Whether it’s jelly beans stuffed into a glossy, plastic egg or a chocolate bunny with giant ears, a basketful of Easter candy is certainly a jackpot. 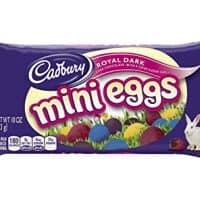 My favorite has always a trifecta of orange Reese’s Pieces shaped like a carrot, licorice jelly beans (I’m weird, I know) and the Cadbury Mini Eggs. Even though I don’t get Easter baskets anymore, I still buy myself a bag of those little eggs! I love to snack on them. One day I’m going to make my friend Meghan’s Chocolate Bourbon Caramel Tart that she decorated with a ring of those pastel beauties. 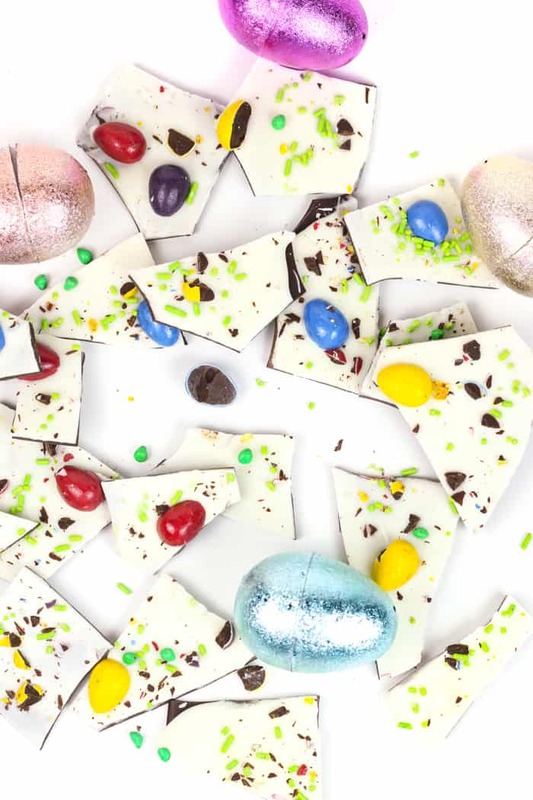 This year I stumbled across a bag of dark chocolate Cadbury Mini Eggs, and knew I wanted to do something fun with them. 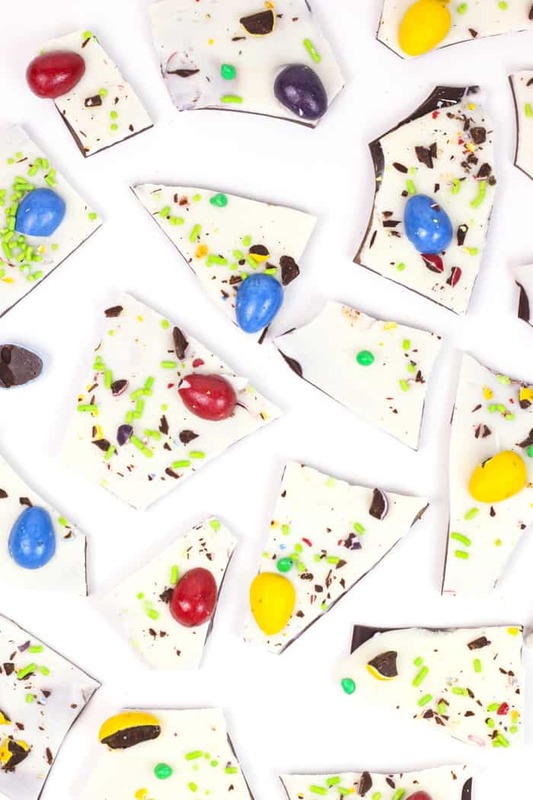 After trying my hand at making white chocolate bark a while back, I dreamed up this version with lots of colorful easter candies on top. 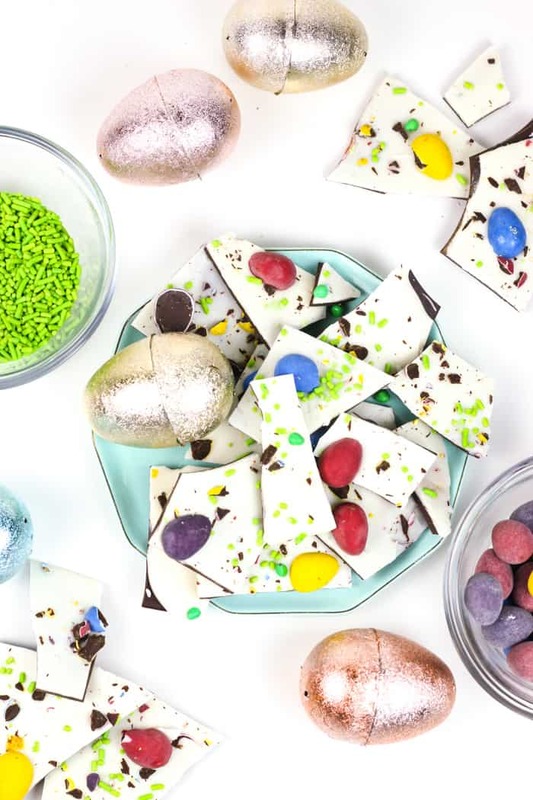 It’s a great use of leftover Easter candy, too! 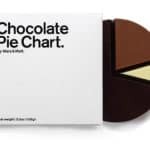 You start with a layer of chocolate — milk or dark, your choice. 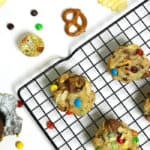 Melt it down and spread it thinly onto wax paper. Let it cool in the fridge, then top with a thin layer of melted white chocolate. Not too thin, though, or you’ll start to swirl in melted chocolate and it won’t be as pure white! 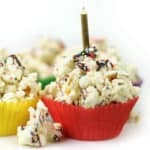 Once you have added the white chocolate layer, you can top it with whatever candies you like! And quickly, while it’s still melted. 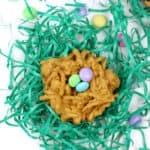 I used the chocolate eggs and tons of sprinkles, but the sky is the limit! 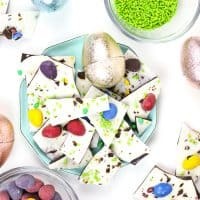 This Easter Candy White Chocolate Bark will make the best treat for your neighborhood Easter egg hunt. 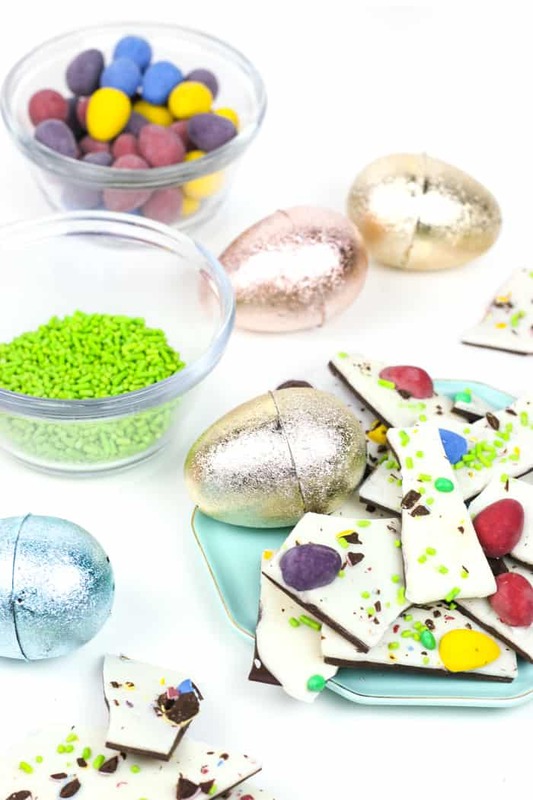 You can also bag it in cellophane bags and drop it into the Easter baskets of all chocolate lovers you know. It would also make a great Mother’s Day present — top it with all of Mom’s favorite candies! Or you can eat it all yourself — absolutely no judgment! 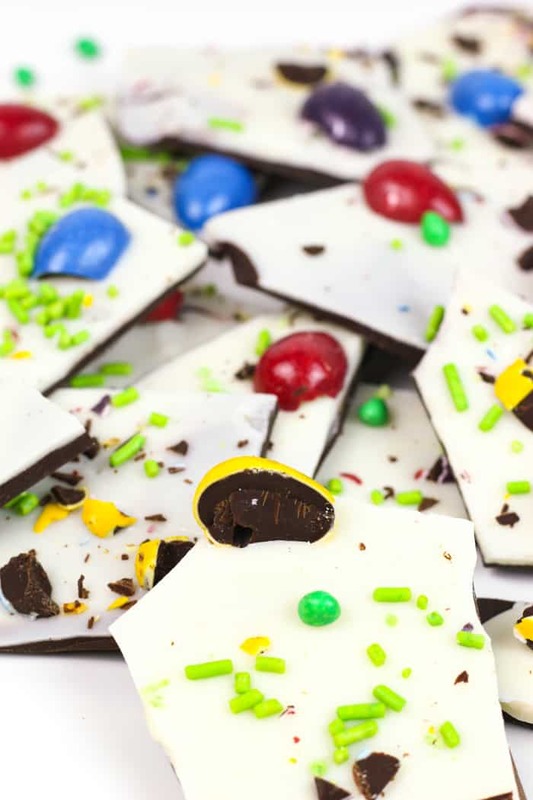 Easter Candy White Chocolate Bark is a bright, colorful treat to celebrate spring! In a microwave-safe bowl, melt the chocolate chips in 20-second intervals, stirring in between until melted. Spoon onto the baking sheet and spread to make a thin layer. Place in the fridge for 5-6 minutes to set temporarily. Meanwhile, melt the white chocolate in 20-second intervals, stirring in between until melted. Remove the baking sheet with the slightly hardened chocolate from the fridge, and spoon the white chocolate over top. Spread in a thin layer, being careful to keep it thick enough that the chocolate does not show through. 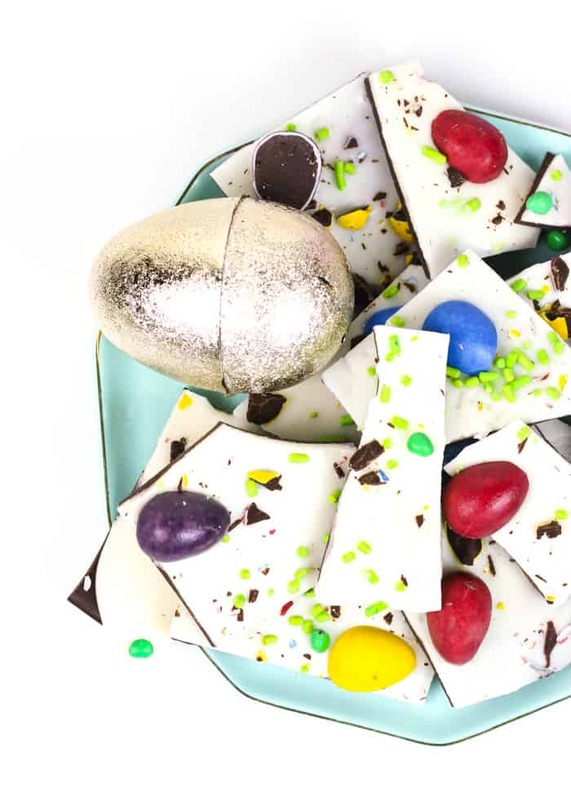 Working quickly, top the bark with Easter candy and sprinkles all over the top of the white chocolate layer. Refrigerate until set, about 30 minutes. Remove and peel from the wax paper, then break the bark into small pieces. Store in the fridge in an airtight container. 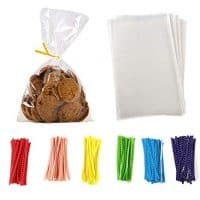 100 Pcs 6 in x 8 in Clear Flat Cello Cellophane Treat Bags Good for Bakery,Popcorn,Cookies, Candies,Dessert 1.2mil.Give Metallic Twist Ties! Thanks for sharing this, Suze! It looks AMAZING and so colorful AND fun! Thanks so much, Kate! So so glad you enjoyed!